Our range of products include rotary sievers. Our consistent efforts and dedication enable us to carve a niche as a most trustworthy manufacturer and exporter of Rotary Seivers. 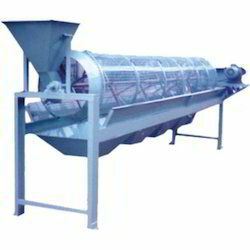 These seivers are used for screening and filtering granular, powdery and serous materials.These machines are more suitable for sieving fineness above 80 mesh to 300 mesh. The close tolerance blades and adjustable wire brush is provided to sieve the maximum fine material. Easy cleaning arrangements and continuous operation can be mode in this machine.